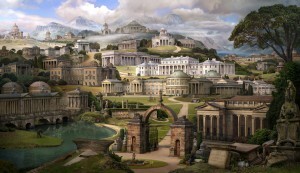 These two works celebrate the legacy of the British Neo-Classical architect Sir John Soane (1753-1837). Each is a reworking of Soane’s ‘built’ and ‘unbuilt’ projects by his architectural illustrator, Joseph Gandy: Perspective of various designs for public and private buildings executed by John Soane between 1780 and 1815 as if they were models in a gallery (1818) and Architectural Visions of Early Fancy, In the gay morning of youth and dreams in the evening of life (1820), respectively. In Grand Tour: In Search of Soane (after Gandy) 2012, Allchurch made a personal tour of England to photograph Soane’s extant buildings two centuries after they were built. Grouped together as though models in a room, scale is distorted and sense suspended. 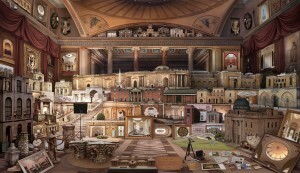 In the bottom right corner the artist displays the tools of her trade (camera, tripod, research materials), just as Gandy depicts Soane with his architectural instruments. The piece was initially created for the exhibition Sense of Soane at Pizhanger Manor, Soane’s former country home in Ealing, and was exhibited in the RA Summer Exhibition 2013. For Grand Tour II: Homage of Soane (after Gandy) 2017 Allchurch received a travel grant from a-n to tour the UK and photograph examples of neo-classical architecture which she could then use as a kit of parts to digitally construct Soane’s ‘unbuilt’ projects to appear as though they had in fact been built. These composite buildings have been placed in a hybrid Arcadian landscape comprised of numerous English gardens (from Stourhead to Castle Howard), through to the rugged mountains of Arthur’s Seat in Edinburgh and Scafell Pike in the Lake District.